Near the end of a productive year (51 posts in 10 months), it appears that I have done something I've only done once before in the history of my blog--I missed an entire month! A span of 38 days went by where I did not post any items to this website and that would be considered a "drought" instead of the few "hiatuses" I took while doing my journalism certificate program. 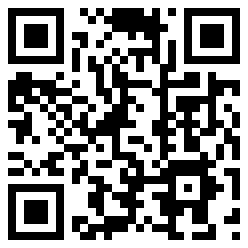 A little bit of background information will help explain the rationale for my absence. 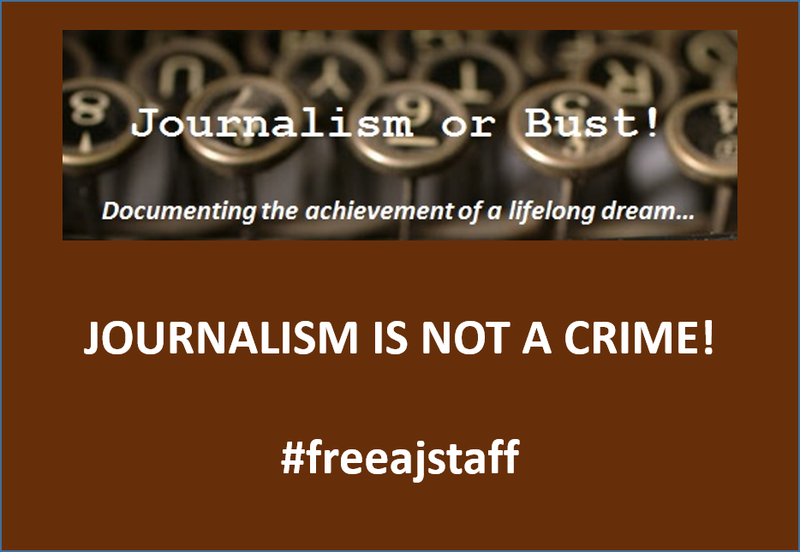 Back in July, I started an 8-part series about my "journo-less" summer where I mentioned that I was unemployed at that time. Unfortunately, that situation remains in effect and it seemed to come to a head in October when yet another delay was going to push any job hopes off until early in 2015 (at the earliest). Once my state jobless benefits ended in early August, I've been on my own and things have become more critical on the financial front as the months have gone by. With the day-to-day anxieties weighing heavily on me, I did what any 50-something might do--I ran away from home (with my wife's permission) and took a credit card-funded "road trip" to get me away from my problems for just a little while. I got to see one of the controversial Jon Husted posters firsthand at my county election board when I cast an early ballot for the November mid-term election. Realizing that I would be out of the state for the general election on November 4th, I made the quick trip out to my county's election board in order to cast my ballot early. Although there was a line, it was not as long as the ones I remembered for the 2008 or 2012 presidential elections and it took me about 20 minutes from my arrival until I was back in my car for the return drive home. While I was there, I did notice a poster (displayed above) that attracted a lot of attention in statewide political circles. Unlike the federal ballots where only the chief executive and their running mate are featured, Ohioans cast votes for governor, lieutenant governor, two "cabinet" positions (attorney general, treasurer) and two others (auditor, secretary of state) that have tangential state-level equivalency to the GAO and the Commerce Secretary (with election oversight responsibilities thrown in), respectively. It's that last position--and it's controversial incumbent--that caused some commotion between the two major parties in Hamilton County (the greater Cincinnati area). 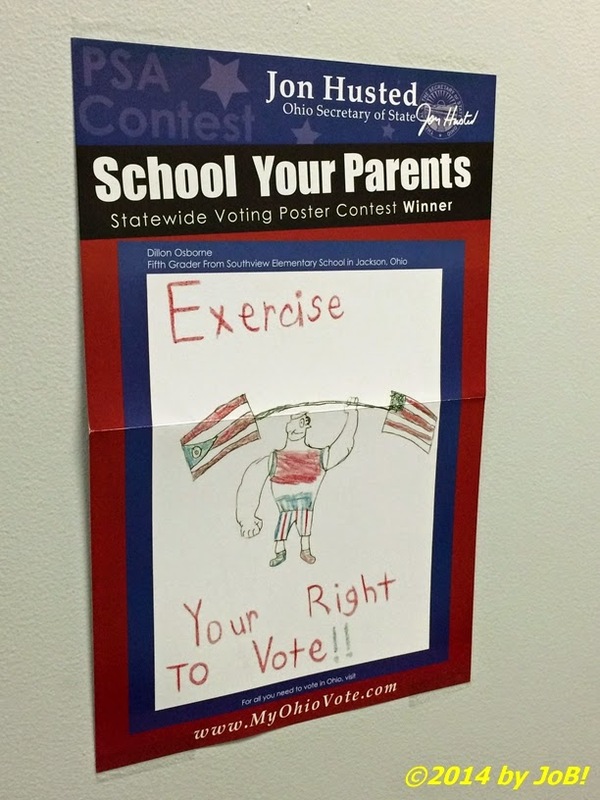 The issue surrounded a poster that was supposed to hang in all of the state's polling places that had Jon Husted's name prominently displayed along with a fifth grade student's drawing encouraging voting. Since that Republican office holder was on last month's ballot, Democrats saw that as a violation of state rules governing open displays of campaign-related materials in the voting areas. This was elevated when Husted stepped in and cast the deciding vote in that Hamilton County case and paved the way for it to remain across the state. In fairness, only low information voters would've been swayed by this and the poster above was on the wall outside the door leading into the office where the machines sat. If one looks at the official results, it appears that this issue wouldn't have made that big of a deal. With my civic duty accomplished, I had a clear conscience to make my way back to Northeastern Pennsylvania to visit family members and walk through some of the haunts from my younger days to clear my mind and reconnect with my roots. Sandwiched between these visits was an employment-related trip to the Boston area. I arrived there on Election Day eve and was able to view the "Republican Landslide" that had been forecasted for months in Ohio as well as nationally via cable and local news outlets. 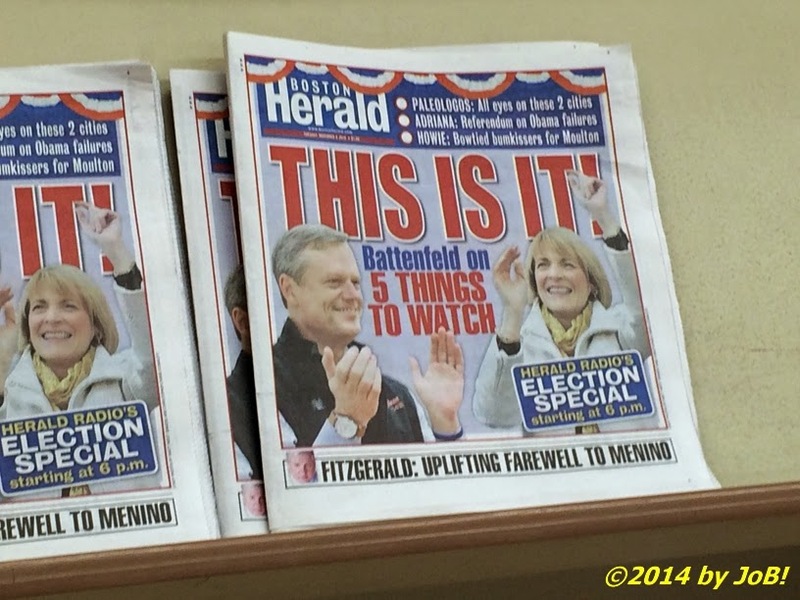 The front page of the Boston Herald on Election Day hinted at a very tight gubernatorial race between the sitting state attorney general (Democrat Martha Coakley) and a former cabinet official/businessman (Republican Charlie Baker). The latter won by just over 40,000 votes. With the official portion of my visit was completed on the first day, I met up with an old high school friend and we made arrangements to spend part of the next day touring downtown Boston, primarily the area around the southern end of the city's Freedom Trail. After a late lunch at a place "where everybody knows your name", we meandered through the shops at Quincy Market and Faneuil Hall for mandatory souvenir shopping before being guided by a sidewalk-embedded trail through the glass and steel downtown areas to see the Old State House, the Old South Meeting House and Boston Common. Across from that last location stands the Massachusetts State House where my astute eye noticed several ENG trucks with masts deployed for remote spots for the early evening news segments related to the very close gubernatorial election between the state's attorney general Martha Coakley and former cabinet official and businessman Charlie Baker. Because of the small margin of victory, the Democrat Coakley did not concede to her Republican rival Baker until after 8am that morning so there was still a media "buzz" in the air over this result when we were walking by. A table was set up inside Quincy Market for people to offer their condolences to the family of the recently deceased mayor Thomas Menino. 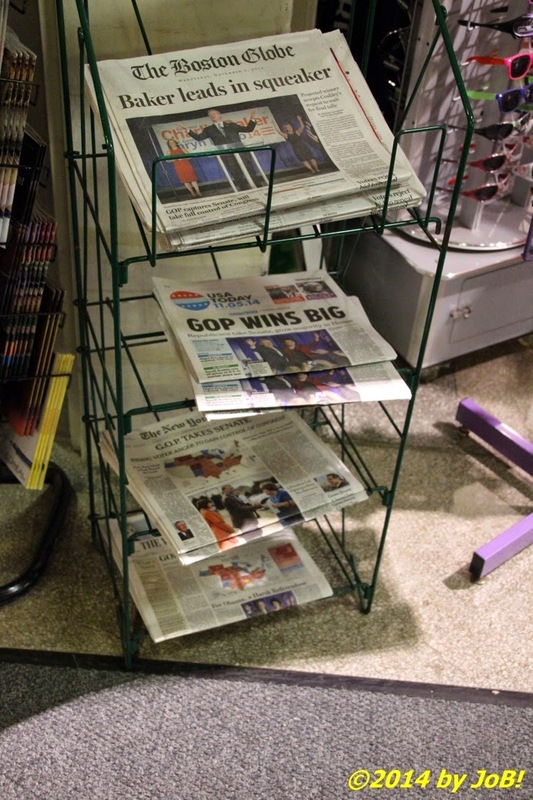 A newspaper rack inside Faneuil Hall provided tangible evidence of the midterm election results. 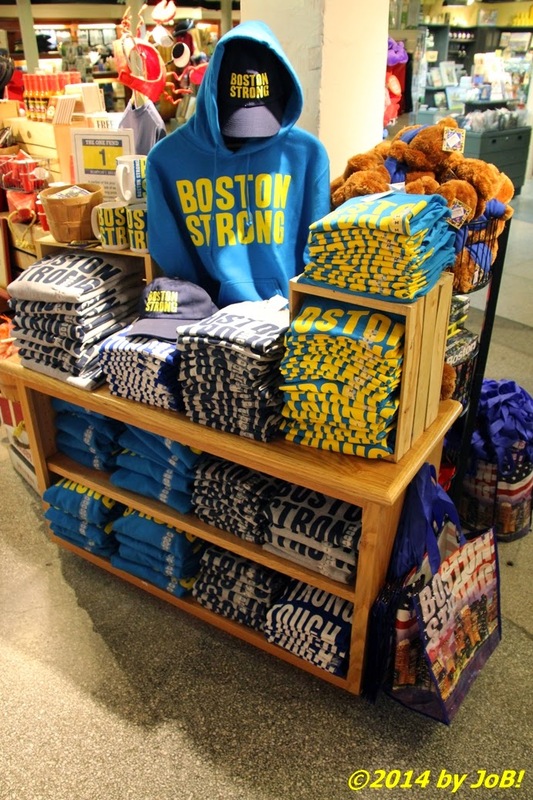 A souvenir shop featured several "Boston Strong" items to show the city's resolve after the April 2013 bombing at the Boston Marathon. 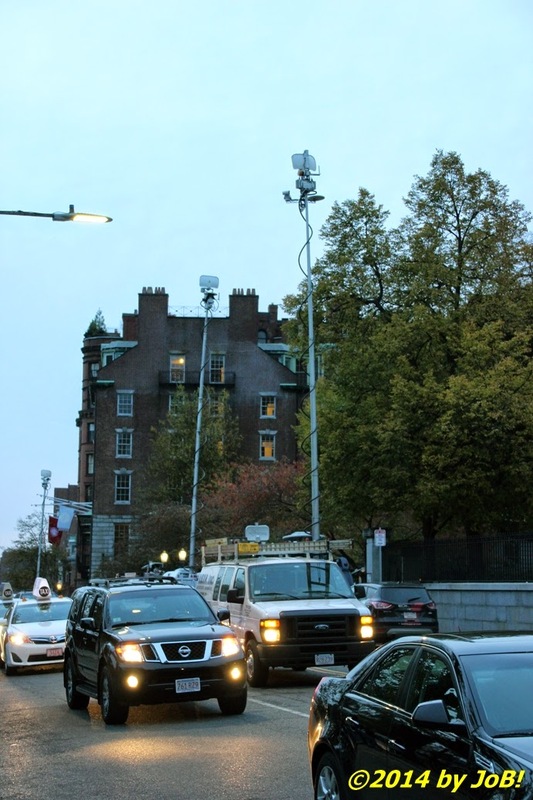 Television news ENG trucks deployed outside the Massachusetts Statehouse on the day after the November 2014 midterm elections. While that election and the 18th century history were primarily in my mind, there were other events in Boston's more current history that also attracted my attention. 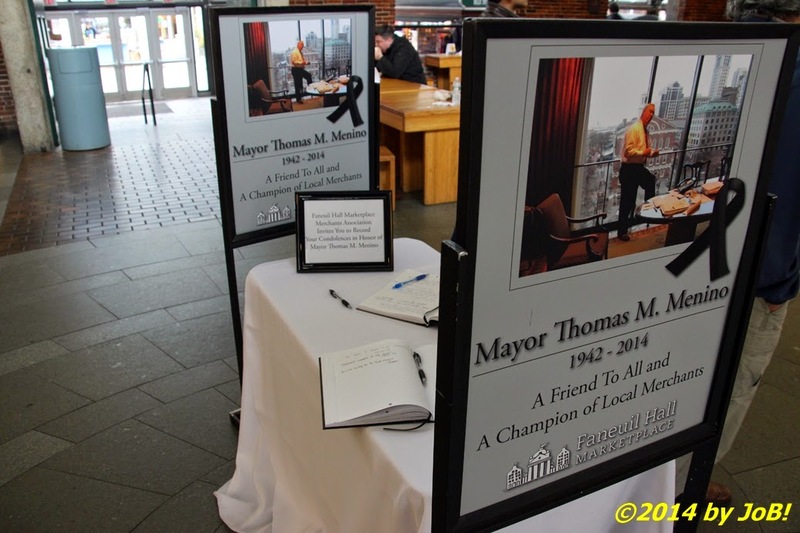 Thomas Menino, the city's longest serving mayor, died on October 30th of a recently diagnosed illness and his body lied in state in Faneuil Hall on November 2nd with his funeral being held the following day. A table was set up inside Quincy Market for visitors to offer their condolences to the family. Although not as prolific as I would've thought, I did see several stores featuring "Boston Strong" branded merchandise for purchase. That slogan was popularized in the aftermath of the bombing at the finish line of the 2013 Boston Marathon as a visible demonstration of the city's resolve to bounce back after that terrorist act. Although not pictured, we did walk through the Boston Public Garden and near its western edge is the Garden of Remembrance: 9/11 Memorial, a site that was dedicated in 2004 to the 206 individuals with Massachusetts ties who lost their lives due to those September 2001 attacks. 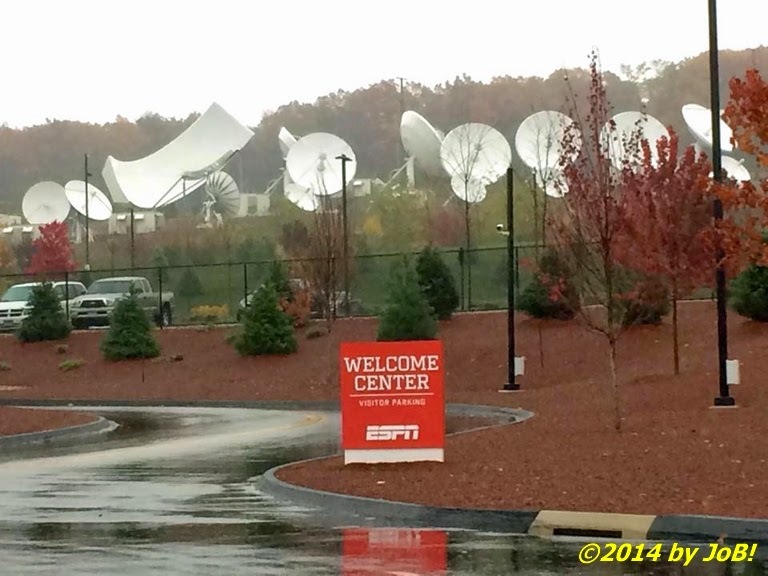 A quick photo stop at the Bristol, Connecticut campus of ESPN was purely by accident. My time in Massachusetts went by much too quickly and I had to contend with a constant downpour during my return trip to Pennsylvania. While trying to find someplace to eat lunch, I happened to stumble across the world headquarters of ESPN and I grabbed a few pictures just outside their welcome center. Another reminder of my cognizance of current events came while driving along Interstate 84 when I saw exit signs for Newtown and Sandy Hook, the former being the location of the elementary school massacre of 20 young children and six of their teachers two years ago this month. My visit to "the Keystone State" drew to a rapid close and I made my way back to Ohio and the realities I was able to ignore for a week or so. 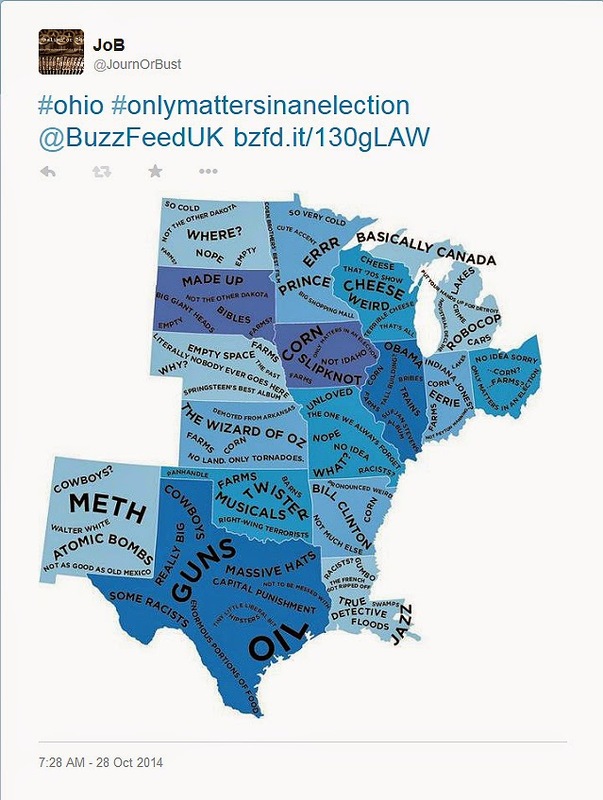 The Brits really don't think very highly of the state of Ohio (at least from the results of an informal polling of Buzzfeed UK office staff and their own stereotypes of this country). Here are my Boston-based "tweets" about the midterm elections. One of the last editions of MSNBC's The Daily Rundown featured former host (and current Meet the Press moderator) Chuck Todd is pictured on the left. As of mid-November, it was "rebranded" as The Rundown, expanded to two hours and Jose Diaz-Balart was named as the host. 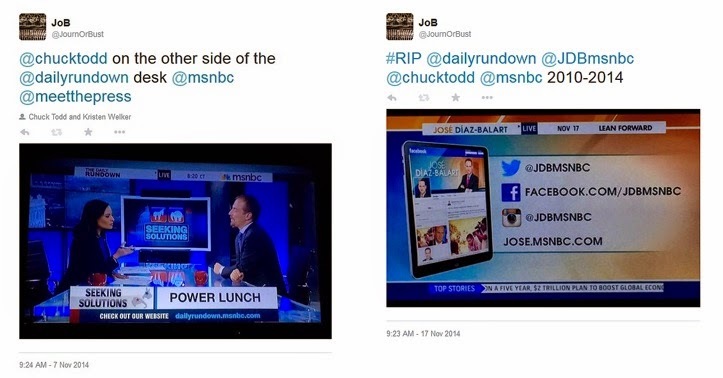 Here are more MSNBC-related "tweets" (breaking news, Ohio politics, and a graphics "flub"). 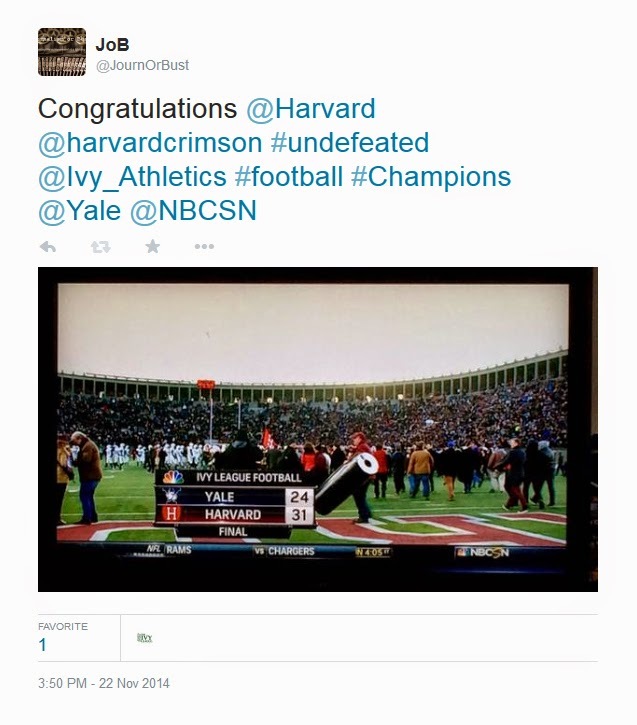 With Massachusetts still on my mind, I watched and "tweeted" about the Harvard-Yale football game on November 22nd. 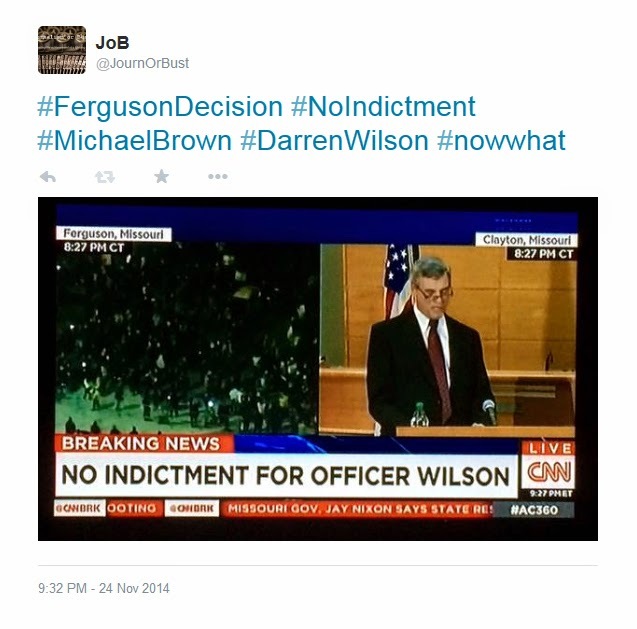 All of the major news outlets covered the grand jury announcement surrounding the Michael Brown shooting in Ferguson, Missouri. 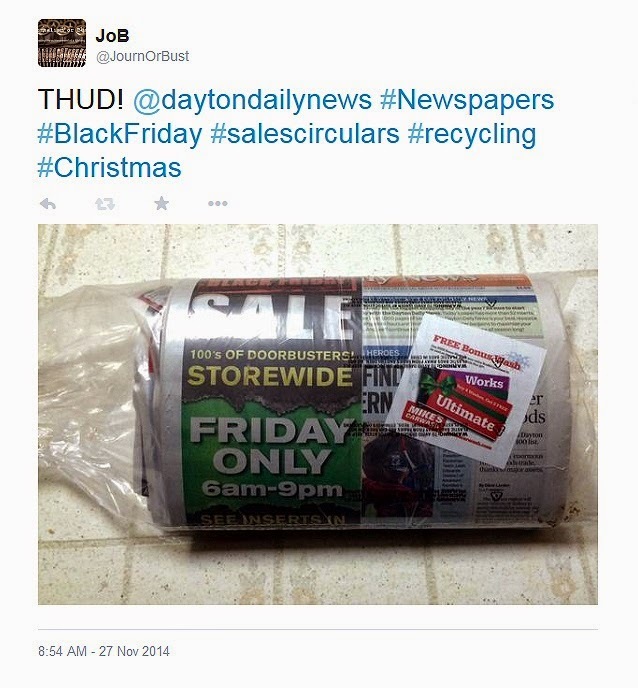 The biggest paper (by weight) is normally delivered on Thanksgiving Day due to the amount of holiday shopping sales circulars. In my present personal and professional "funk", I have found that microblogging via Twitter to be a viable (but more terse) alternative to forcing myself to put fingers to laptop keys and composing the longer pieces that I usually favor here. 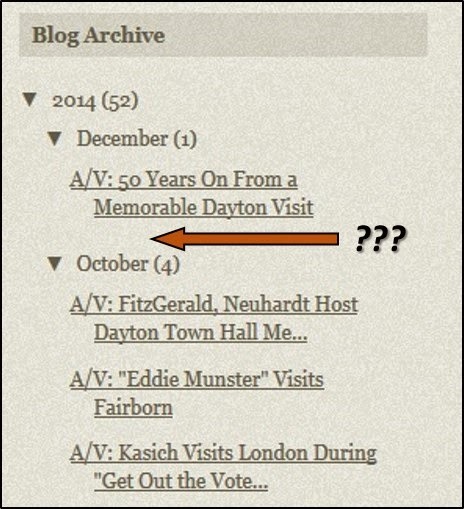 The last one on the UD MLK 50th anniversary remembrance required a focused effort to compose and upload to this blog and I really don't have the enthusiasm right now to search out new reporting opportunities. I'll probably wind up doing some sort of end-of-year recap to close out my 2014 activities unless inspiration can break through my mental malaise to reignite my passion and get me out of my chair and behind my camera lens (it's taken me over a week just to get this post done). After the incredible news week that just passed, one might think that it would be easy to pick a topic or two and just go to town on it but that assumption factors in a person who wants to write and, unfortunately, I'm just not feeling it right now. I can only hope this is a temporary thing and that I will rediscover the enthusiasm that I have openly shared here and on my Twitter account over the past three years because I really wouldn't want this initiative to end on such a sour note. Just between us...this "annus horribilis" cannot end soon enough!